Charming end-of-terrace two storey cottage situated in a superb position at the foot of the Mourne Mountains, overlooking Newcastle Harbour. Uninterrupted panoramic views across Dundrum Bay. 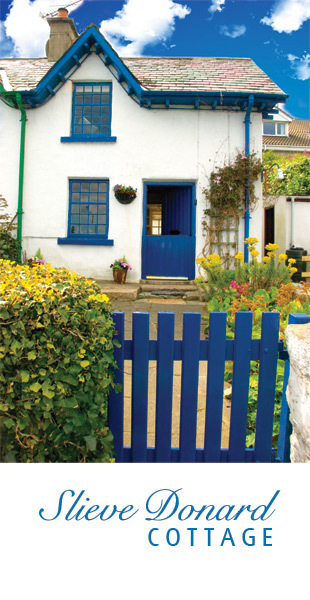 Listed building steeped in history, one of 12 cottages built in 1843 for the widows of a fishing disaster. The cottage is conveniently located (about a short stroll to Newcastle Town Centre) with a range of cafes, restaurants and shops close by. The cottage has a double bedroom which overlooks seaviews and twin bedroom. Luxury freestanding bath and spacious shower. Fully equipped kitchen with dishwasher, washing machine, tumble dryer, microwave, cooker, fridgefreezer, and iron facilities. Slieve Donard Cottage is surrounded by landscaped areas to relax and enjoy the fantastic seaviews.